Most of us are judgmental people, and quick to criticize another, especially if he or she comes from a different place, or thinks in ways that are opposite to ‘our’ ways. My mother loved to quote that prayer. In fact, just a week or so ago when I was in Destin, my sister and I were discussing how our mother often reminded us to try to feel what another person was feeling. But how often are we truly empathetic? It’s not that we don’t have empathy for some situations. We cry in sad movies, we feel badly for people we read about who are going through tragedy. But sometimes those who are closest to us don’t get the same treatment. I think we’re so close to them, we expect them to think and feel the same as we do, so we may not try to understand. And then there are other times when the ‘politically correct’ sort of empathy takes over— current positions that those in power make us think we ‘ought’ to feel, or else we’re less than human, or at the very least inferior to what ‘they’ are. I have to ask then— Is that sort of empathy contrived? Not all of us come from the same place. Empathy means attempting to see what has happened in a person’s life that led him or her to be the person he projects to others. But what has happened to a person in the past does not take away responsibility for what he does in the present. Empathy goes just so far. Still, we must practice it. We must be less quick to criticize–that is unless we’re just ABSOLUTELY PERFECT ourselves. Well, we know that’s not the case! First: Let’s try on those other moccasins, and walk in them a bit. 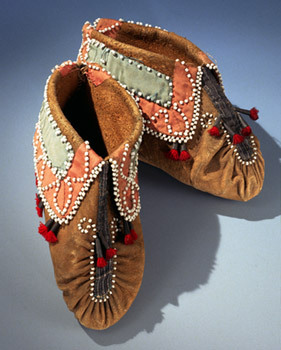 Second: If you want me to walk in YOUR moccasins, then you should try to walk in MINE as well. In that way—and only in that way—we’ll never walk alone.